Zone A of Nanjing Xianlin Hubin Tiandi is situated at No.1 Xuehai Road, Qixia District, the core location of the developing sub-CBD. The total GFA of Zone A is 42,795 sq.m.. Xianlin Store changes its business model into “Outlet Mall” for the first time in Nanjing. On 11 November 2017, Zone B of Nanjing Xianlin Hubin Tiandi commenced operation. Located at the central business district of Xianlin University City in East Nanjing, the commercial project enjoys access to Metro Line 2 with GFA of approximately 160,000 square meters. It features the self-operated G·MART premium supermarket, G·TAKAYA boutique bookstore, and G·BEAUTY beauty variety store, as well as various experience-based amenities such as children's education, distinctive dinning, arts, culture and creativity, and boutique cinemas, etc. 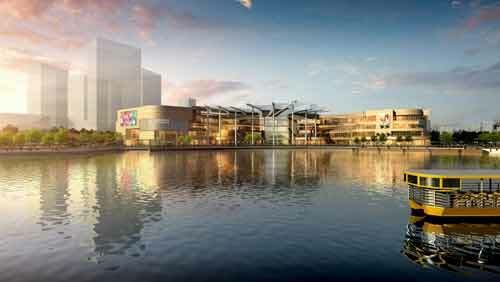 Along with Zone A of Xianlin Hubin Tiandi, a mature operation of the Group for years, coupled with amenities such as open-air park and sunken square around the lake, the project becomes a part of the landmark lifestyle experience center of East Nanjing.As at 31 December 2018, the GSP of Nanjing Xianlin Store reached RMB901 million in the full year.